- Tests and trials are all part of this journey that we call life. 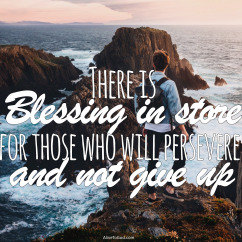 - There is, however, blessing in store for those who will persevere and not give up. - So let us pass the test and be ready to receive His blessings on our lives. - In the end, there awaits a ‘crown of life’ that He has promised, so stand firm. - Doubt and belief cannot cooperate with each other. - We either doubt or we believe. 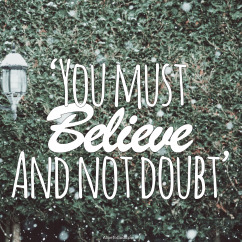 - Doubt robs us of our confidence and brings instability and insecurity into our lives. - When we believe, we can stand secure and walk in confidence with the Lord. Prayer: Lord, I choose to believe, and I choose to reject doubt and its cohort of fear. I will believe, regardless of how the situation may look or present itself to me. I will trust and not be afraid. Amen. 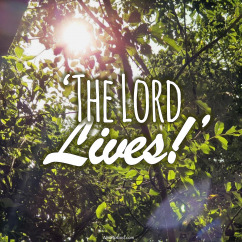 - The Lord lives – never doubt His existence or His care for you. - The Lord is your defender and the One who protects and provides for you. - Speak out about His greatness and His goodness, so that all around you can hear of it. - He will save you, He will come through for you and He will be a living reality to you. - The Lord is very interested in the condition of our hearts. - Hardened hearts produce problems and pure hearts produce life. - Give Him the right of way to work within your heart and spirit. 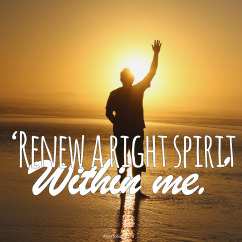 - He will cleanse your heart and He will renew your spirit within you. Prayer: Lord, I give you my heart, I give you my soul, I live for You alone. Every breath that I take, every moment I’m awake, Lord have Your way in me. Amen. - Do you realise that the way you live your life can have intergenerational results? - If your life would have an effect on a generation not yet born, would it change things? 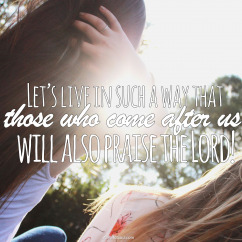 - Let’s live in such a way that those who come after us will also praise the Lord. - Your life is much more than just the moment you are in, it has a lasting effect. - It is often difficult when we face tests and trials. - But even the test and trials of life is something that the Lord uses. - He takes the things we go through and produces more of His character in our lives. 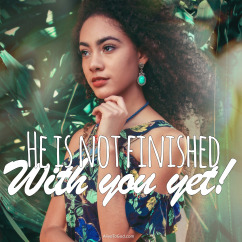 - If you are facing some tests, take heart, He is not finished with you yet. Prayer: Lord, I have to admit that tests and trials, especially of my faith, are not always easy, but I realise that You are at work in me. May my life bring You the glory and praise that You are worthy of. Amen. - Our lives should be rooted and built on the foundation of His great love. - The underlining reality of our daily lives should be the fact that He loves us. - His love is something we need to grasp, because it is so great that we can’t miss it. - May you know, beyond any doubt, how greatly you are loved by the Lord. Prayer: Lord, thank You for Your great love for me. Today I realise that Your love is far more than my mind and heart can ever conceive or grasp, but I will rest in the knowledge that You love and care for me. Amen. - At first glance this may seem like a great contradiction. - But the Lord makes sure everything we go through has purpose and meaning. - He takes the ‘many trials’ and works through them to bring about good. 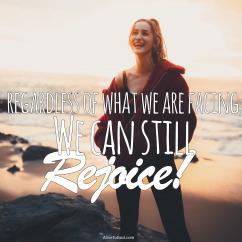 - It is for this reason, that regardless of what we are facing, we can still rejoice. - The Lord wants us to experience and enjoy His grace in and on our lives. 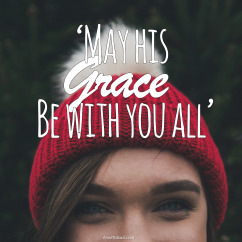 - His grace is His kindness, favour, goodwill and love that is leaning towards us. - We can just reach out and take hold of it for ourselves. - Take hold of it for yourself today, and never let it go! Prayer: Lord, thank You for Your grace towards me. I take hold of it, by faith, right now, and I declare that Your grace, kindness, favour, goodwill and love are mine today and always. Amen.